I love Spring! I love the warmer weather, I love the birds singing and I love all the Easter treats! 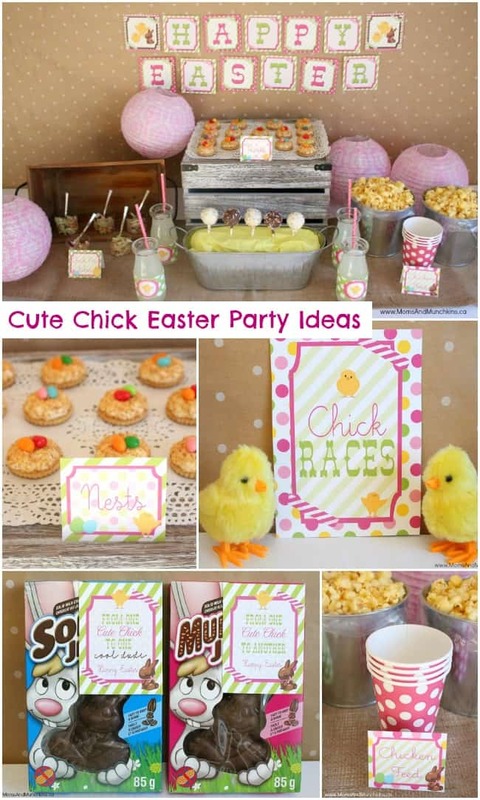 These Cute Chick Easter Party ideas are perfect for your little chicks and your cool dudes. 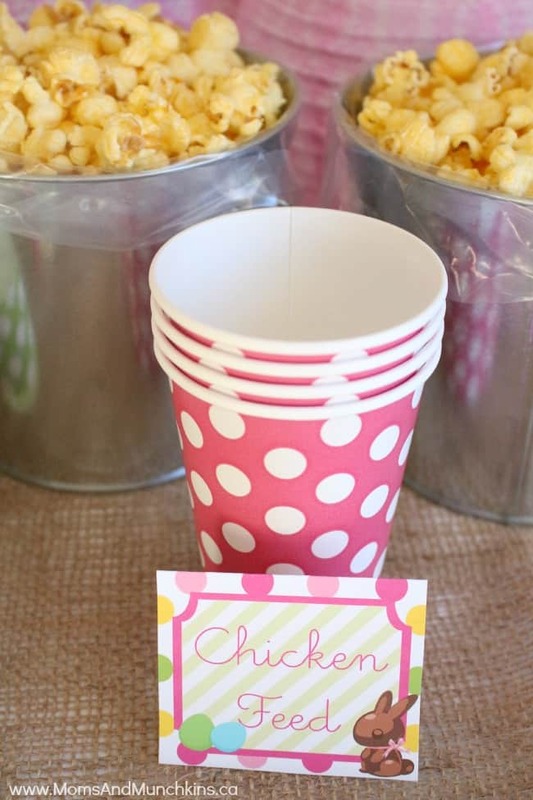 The printable party package featured here (by Just a Little Sparkle) is customizable for both genders. Here I’ll share ideas with you for decorations, food, activities and more! 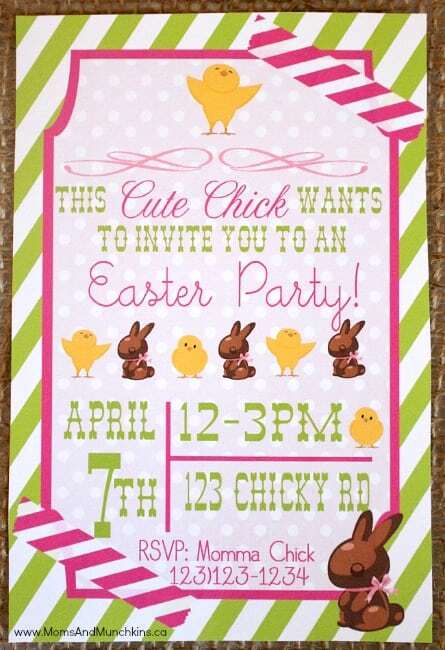 You can invite your little chicks and your cool dudes to your Easter party with this adorable invitation customized with your party details. For hand-delivered invitations, you could create egg-shaped envelopes to hold the invitations. For this party theme, I went with a bit of a rustic/western feel with wooden boxes, burlap sack, brown paper backdrop, metal pails, etc. 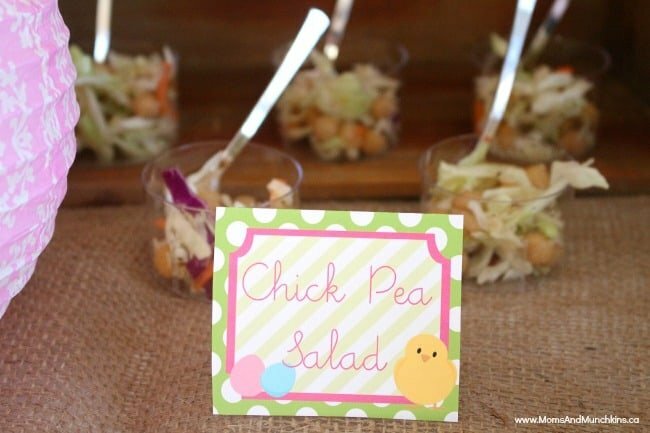 Your buffet table could include healthy choices such as chick pea salad and air popped popcorn served in metal pails and labeled as “chicken feed”. The Chick Pea Salad here is just coleslaw, chick peas and Italian dressing. It’s really easy to make and tastes great! 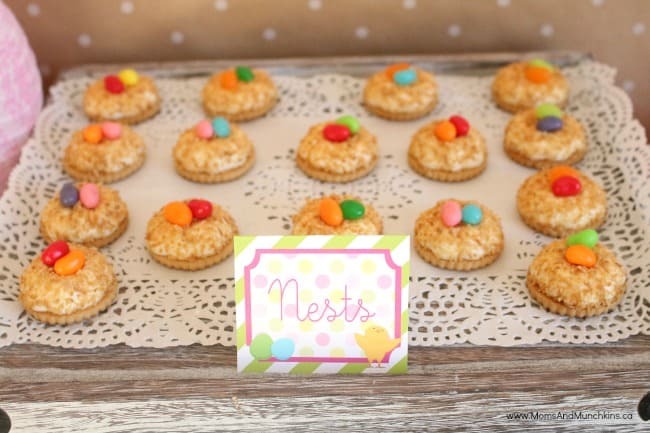 Dessert options could include cupcakes, macaroon or cookie “nests” filled with chocolate eggs, jelly beans and truffles with icing in pastel colors, cake pops, cookies…so many delicious ideas for an Easter dessert table! 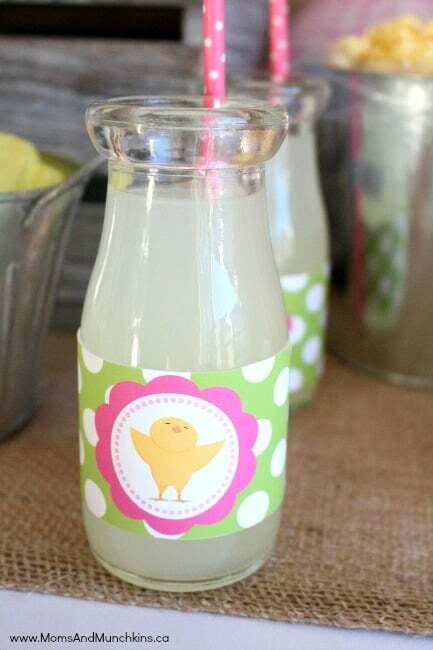 Yellow lemonade covered in printable labels is an excellent choice for a party drink. Other drinks that would go well with the theme include milk, pink lemonade, and bright colored soda pops. You can create a simple obstacle course game using spoons, hard boiled eggs and plastic safety cones. The goal of the game is simple – complete the obstacle course while balancing your egg on your spoon (no hands on the egg, just on the spoon). Try not to let the egg fall to the ground and crack. 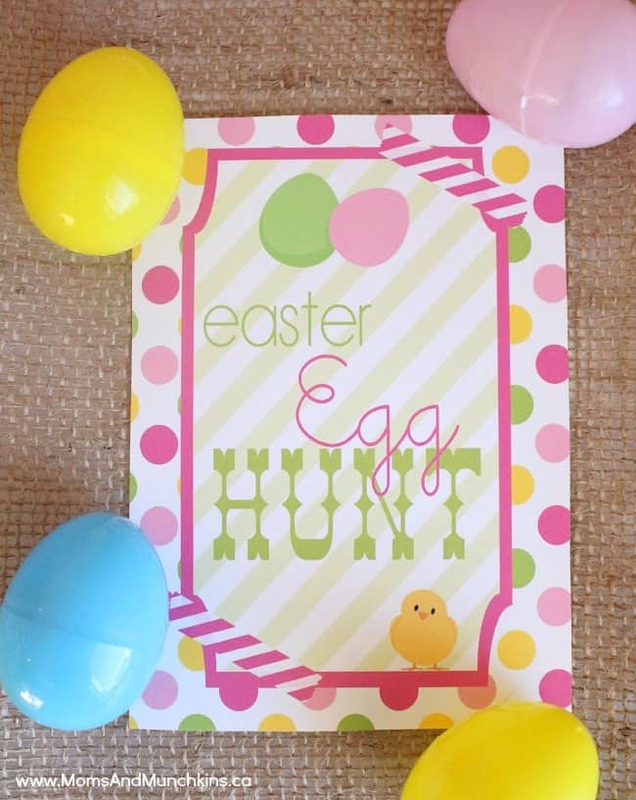 One of the most popular games at an Easter party is an Easter Egg Hunt. 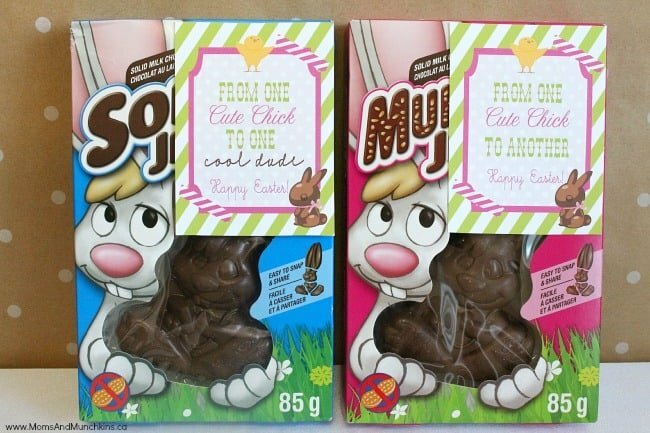 Plastic eggs can be filled with items such as stickers, mini chocolate eggs, hair elastics, temporary tattoos and more. 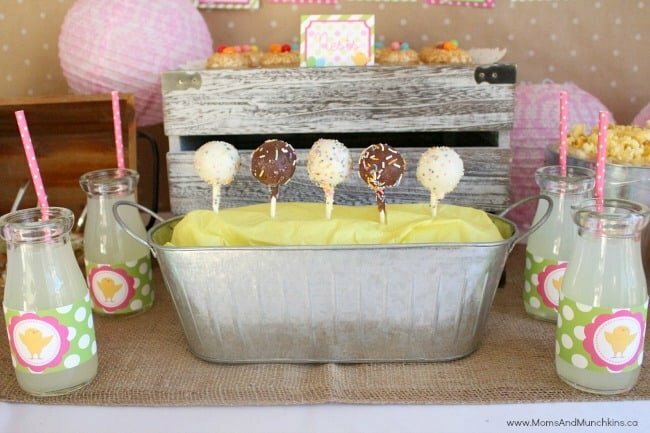 Simply hide the eggs around the party area and let the kids make some fun egg discoveries. 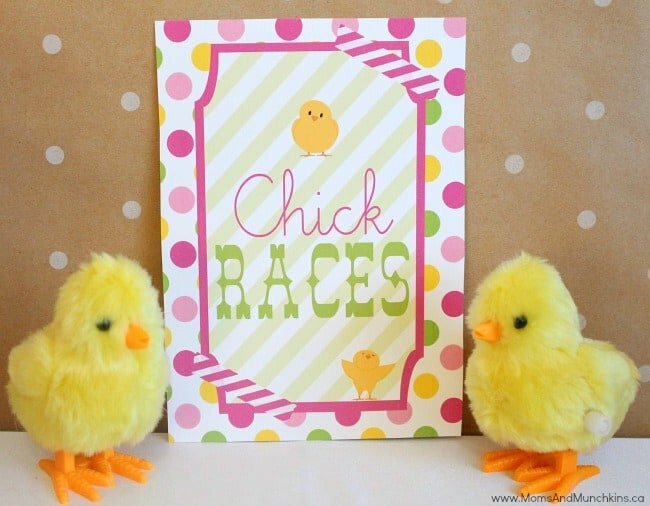 Wind-up chicks and bunnies can be used for a fun Chick & Bunny Race. Simply create racetracks on a flat surface using thin strips of colored tape. The first wind-up toy to cross the finish line wins! All of the printables featured here are available through Just A Little Sparkle. For more ideas on holiday fun, follow along on Facebook, Twitter, Pinterest and Bloglovin’. 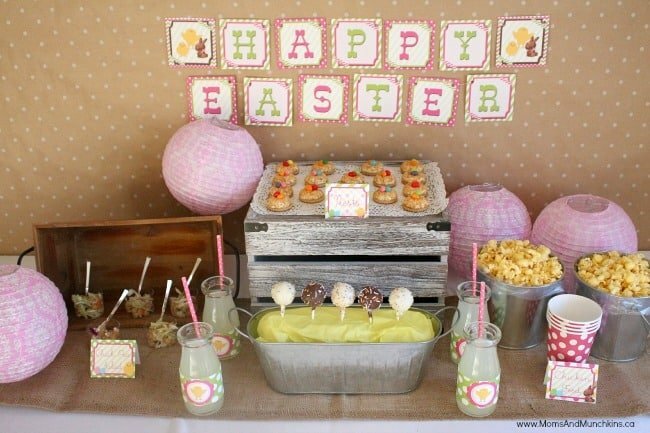 *Disclosure: Just a Little Sparkle provided these party printables to Moms & Munchkins free of charge.